. Complex behavior can occur in any system made up of large numbers of interacting constituents, be they atoms in a solid, cells in a living organism, or consumers in a national economy. Scientific theories about this behavior typically involve many assumptions and approximations. 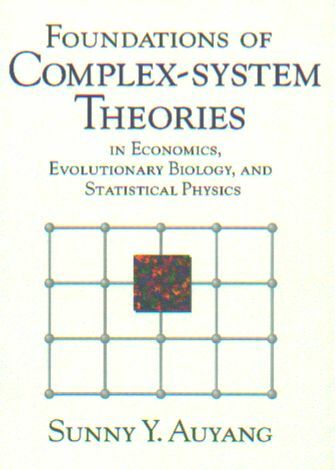 Foundations of Complex-system Theories analyzes and compares, for the first time, the key ideas and general methods used in studying complexity in the physical, biological, and social sciences. It highlights the features common to the three areas, clarifies conceptual confusions, and provides a nontechnical introduction to how we understand and deal with complexity. The book begins with a description of the nature of complexity. The author then examines a range of important concepts: situated individuals, composite systems, collective phenomena, emergent properties, chaotic dynamics, stochastic processes. Each topic is illustrated by extended examples from statistical physics, evolutionary biology, and economics. What the sciences investigate are very different, but how the sciences address their topics has certain general commonality, which illustrates, among other things, the general structure of our theoretical reason. Besides the three sciences, the book also examines several mathematical theories widely used in complexity research: nonlinear and chaotic dynamics, the calculus of probability and stochastic processes. It lays out the conceptual structures of these mathematics and explains what make them so powerful. By exposing the common conceptual foundation of deterministic dynamics and stochastic processes, it refutes both the doctrines of determinisim and chance. This detailed yet nontechnical book will appeal to anyone who wants to know more about complex systems. It will also be of great interest to philosophers engaged in scientific methodology and specialists studying complexity in the physical, biological, and social sciences. § 37. The Survival of the Fittest or the Luckiest?